Completed just this year, Seattle's Firestation No. 30 is committed to the ongoing safety of the Mt. Baker community. 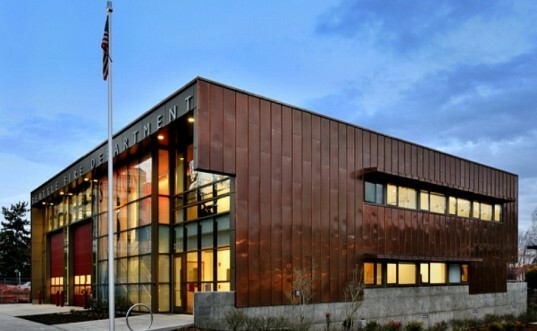 Designed by Schacht Aslani Architects, the two story structure is the temporary home of six on-duty firefighters. Built with minimal impact on the landscape and enough sustainable strategies to achieve LEED Gold certification, the station is also a green beacon for the community. 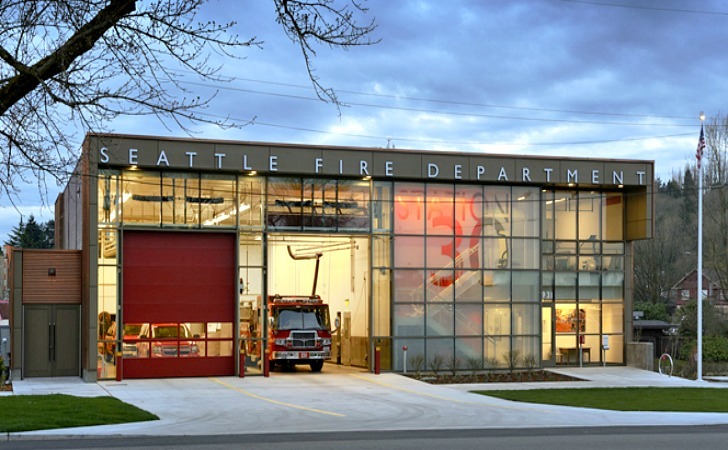 The Seattle fire station is framed in copper sheeting and is fully transparent on one side to open the inner workings up to the neighborhood. Located at the juncture between the commercial activity of Rainier Avenue and the residential Mt. Baker neighborhood, Firestation no. 30 helps with the transition in scale between the two areas. Its highly transparent facade on the north side lets passersby get a glimpse of the activity going on inside, which improves the connection to the community. At night, the illuminated station is like a beacon and safe haven. Natural daylighting is balanced through the use of clerestory windows, skylights, north glazing, sun shading devices and fritting. The building is located in a liquefaction zone, which means the soil is poor. To maintain the building’s integrity, it had to be made lightweight, so it was constructed out of a light wood frame and sheet metal skin be placed atop an elevated structural slab supported by an auger‐cast pile system. A geothermal heat pump system provides energy efficient heating and cooling, while materials were selected based on their sustainability in terms of content, cost and maintenance requirements. Rainwater is collected on the roof and directed to a bioswale on the west of the site. The project achieved LEED Gold certification. The station will be part of the Tour of Architects on March 25th. Located at the juncture between the commercial activity of Rainier Avenue and the residential Mt. Baker neighborhood, Firestation no. 30 helps with the transition in scale between the two areas. Its highly transparent facade on the north side lets passersby get a glimpse of the activity going on inside, which improves the connection to the community. Natural daylighting is balanced through the use of clerestory windows, skylights, north glazing, sun shading devices and fritting. The building is located in a liquefaction zone, which means the soil is poor. To maintain the building's integrity, it had to be made lightweight, so it was constructed out of light wood frame and sheet metal skin be placed atop an elevated structural slab supported by an auger‐cast pile system. A geothermal heat pump system provides energy efficient heating and cooling, while materials were selected based on their sustainability in terms of content, cost and maintenance requirements. Rainwater is collected on the roof and directed to a bioswale on the west of the site. The project achieved LEED Gold certification.